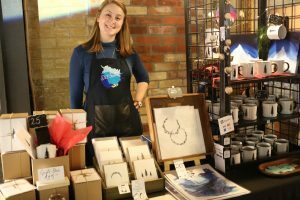 This year, Toronto’s Eco Lifestyle market had a holiday twist, with the focus on encouraging shoppers to purchase local Christmas gifts. The market is always a busy event, with over 50 local vendors. Walking around the market, people can find sustainable, eco-friendly and handcrafted items for themselves or for loved ones. With shopping malls being so busy this time of year, Eco lifestyle market promotes purchasing gifts that are one of a kind and personal. Shopping local can sometimes means having to pay more for items. “If costumers are willing to pay a little bit more for a product that has been ethical sourced , intern they are supporting the development and economy of small businesses,” Baldex adds. Kate Scott is owner of Dot Scot Studio. The Eco Lifestyle market started in August of 2016 and has since been bringing together some of Toronto’s top wellness vendors. The market also gives local businesses a chance to showcase their company. The event is bi-annual, with one market in the winter and one in the summer. Vendors who wish to participate can visit, The Eco Lifestyle market website to apply. 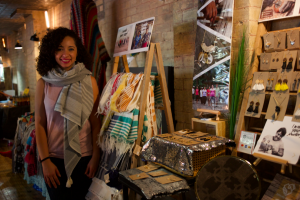 The Eco Lifestyle market is hosted at The Great Hall event venue in Toronto. Those who are interested in a similar event, can check out The Trinity Bellwood Flea. Many of the vendors will be at this event hosted at the same venue on Dec. 16 2018 from 10 a.m. to 5 p.m.. For more information visit their website.